شیخ, نسرین, کیانفر, شهره. (1393). بررسی کارایی جاذب‌های پلیمری شبکه‌ای درحذف فلزات سنگین آب با استفاده از مطالعات ایزوترم جذب. مجله آب و فاضلاب, 25(6), 20-29. نسرین شیخ; شهره کیانفر. "بررسی کارایی جاذب‌های پلیمری شبکه‌ای درحذف فلزات سنگین آب با استفاده از مطالعات ایزوترم جذب". مجله آب و فاضلاب, 25, 6, 1393, 20-29. شیخ, نسرین, کیانفر, شهره. (1393). 'بررسی کارایی جاذب‌های پلیمری شبکه‌ای درحذف فلزات سنگین آب با استفاده از مطالعات ایزوترم جذب', مجله آب و فاضلاب, 25(6), pp. 20-29. شیخ, نسرین, کیانفر, شهره. بررسی کارایی جاذب‌های پلیمری شبکه‌ای درحذف فلزات سنگین آب با استفاده از مطالعات ایزوترم جذب. 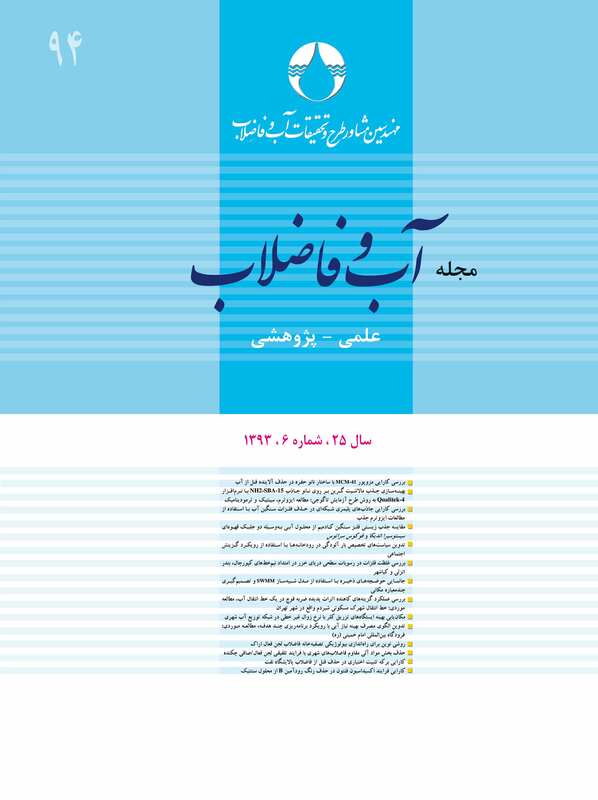 مجله آب و فاضلاب, 1393; 25(6): 20-29. جاذب‌های پلیمری ابزار مفیدی برای حذف فلزات سنگین از محلول‌های آبی به‌شمار می‌روند. از آنجایی‌کهاستفادهاز مدل‌های جذب می‌تواند موجب پیش‌بینی و تسهیل ارزیابی این فرایند شود،لذا در این تحقیق به بررسی رفتارجذبی جاذب‌های شبکه‌ای شده کیتوزان، پلی‌وینیلالکل و ترکیب آنها )نسبت وزنی 1:1)به‌منظور حذف فلزات نیکل و منگنز از محلول‌های آبی، از طریق دو مدل جذب لانگمیر و دوبینین-رادشکویچ، پرداخته شد. جاذب پلی وینیل الکل با هر دو روش شیمیایی و پرتویی و سایر جاذب‌ها به‌دلیل عدم مقاومت کیتوزان به پرتو فقط به روش شیمیایی شبکه‌ای شدند. برای هر دو فلز، مدل لانگمیر تطابق بهتری با داده‌های آزمایشگاهی داشت. بیشینه ظرفیت جذب به‌دست آمده از مدل لانگمیر نشان داد که جاذب کیتوزان/پلی وینیل الکل از جذب بالاتری نسبت به جاذب‌های دیگر برخوردار است. بیشینه جذب توسط این جاذب63/52 میلی‌گرم بر گرم برای نیکل و 30/30 میلی‌گرم بر گرم برای منگنز بود و فلز نیکل بیشتر از منگنز جذب شد. همچنین، پلی وینیل الکل شبکه‌ای شده به روش شیمیایی، برای نیکل بیشینه جذب46/38 میلی‌گرم بر گرم و برای منگنزبیشینه جذب 23/19 میلی‌گرم بر گرم را داشت که نسبت به مقدار مربوط به نمونه شبکه‌ای شده به روش پرتوییبالاتر بود. درنهایت برمبنای نتایج حاصل از این مطالعه مشخص شد که میزان جذب در ارتباط با نوع فلز جذب شده، ساختار جاذب و روش شبکه‌ای کردن آن است. Polymeric adsorbents are useful tools for removing heavy metals from aqueous solutions. Adsorption models are efficient tools for accurate prediction and evaluation of the practical adsorption process in real situation. In this study, the two isotherms of Langmuir and Dubinin-Radushkevich models were employed to investigate the absorption performance of chitosan, PVA, and chitosan/PVA blend (with a weight ratio of 1:1) in the removal of Mn (II) and Ni (II) from aqueous solutions. The PVA adsorbent was crosslinked by both chemical and radiation methods while the others were crosslinked only chemically due to Chitosan’s lack of resistance to radiation. The results showed that the Langmuir model fitted the experimental data better than the Dubinin-Radushkevich one for both metals. The maximum adsorption capacity (qmax) of the Langmuir model showed that the PVA/Chitosan adsorbent had the best adsorption compared to other adsorbents, with 52.63 mg/g for Ni and 30.30 mg/g for Mn (evidently more Ni was absorbed than Mn). Also, maximum adsorption by the chemically crosslinked PVA was 38.46 mg/g for Ni and 19.23 mg/g for Mn, which exhibits a higher level than adsorption by the radiation crosslinked PVA The results indicate that absorption capacity depends on the type of adsorbed metal, absorbent structure, and the crosslinking method employed. 1. Athar, M., and Vohora, S. (1995). Heavy metals and environment, New Age International Publisher, New Delhi. 2. Aklil, A., Mouflih, M., and Sebti, S. (2004). “Removal of heavy metal ions from water by using calcined phosphate as a new adsorbent.” Journal of Hazardous Materials, 112, 183-190. 3. Rostamian, R., Najafi, M., and Rafati, A.A. (2011). “Synthesis and characterization of thiol-functionalized silica nano hollow sphere as a novel adsorbent for removal of poisonous heavy metal ions from water: Kinetics, isotherms and error analysis.” Chemical Engineering Journal, 171, 1004-1011. 4. Gotoh, K., Matsushima, K., and Kikuchi K.I. (2004). “Adsorption of Cu and Mn on covalently cross-linked alginate gel beads.” Chemosphere, 55, 57-64. 5. Inbaraj, B.S., Wang, J.S., Lu, J.F., Siao, F.Y., and Chen, B.H. (2009 ). “Adsorption of toxic mercury(II) by an extracellular biopolymer poly(γ-glutamic acid).” Bioresource Technology, 100, 200-207. 6. Vieira, R., and Volesky, B. (2000). “Biosorption : A solution to pollution. ” International Microbiol, 3, 17-24. 7. Ngah, W.S.W., Kamari, A., and Koay, Y.J. (2004). “Equilibrium and kinetics studies of copper (II) on chitosan and chitosan/PVA beads.” International Journal of Biological Macromolecules, 34, 155-161. 8. Kannamba, B., and Reddy, K.L. (2010). “Apparao BV. removal of Cu(II) from aqueous solutions using chemically modified chitosan.” Journal of Hazardous Materials, 175, 939-948. 9. Elwakeel, K.Z. (2010). “Removal of Cr(VI) from alkaline aqueous solutions using chemically modified magnetic chitosan resins.” Desalination, 250, 105-112. 10. Cao, J., Tan, Y.B., Che, Y.J., and Xin, H.P. (2010). “Novel complex gel beads composed of hydrolyzed polyacrylamide and chitosan: an effective adsorbent for the removal of heavy metal from aqueous solution.” Bioresource Technol., 101, 2558-2561. 11. Shawky, H.A. (2009). “Synthesis of ion-imprinting chitosan/PVA crosslinked membrane for selective removal of Ag(I).” J. Appl. Polym. Sci., 114, 2608-2615. 12. Ezequiel, S.J., Edel, F.S., Alexandra, A.P., Mansur, W.L.V., and Herman, S.M. (2009). “Preparation and characterization of chitosan/poly(vinyl alcohol) chemically crosslinked blends for biomedical applications.” Carbohydrate Polymers, 76, 472-481. 13. Joon-Pyo, J., Young-Kyou, J., Young-Chang, N., and Phil-Hyun, K. (2009). “Effects of gamma irradiation on the thermal and mechanical properties of chitosan/PVA nanofibrousmats.” Journal of Industrial and Engineering Chemistry, 15, 430-433. 14. Mahendra, K., Bijay, P.T., and Vinod, K.S. (2009). “Crosslinked chitosan/polyvinyl alcohol blend beads for removal and recovery of Cd(II) from wastewater.” Journal of Hazardous Materials, 172, 1041-1048. 15. Montserrat, R., Ana, M.S., and Eric, G. (2000). “Palladium sorption on glutaraldehyde-crosslinked chitosan,” Reactive and Functional Polymers, 45, 155-173. 16.Warren, H.P., and Li-Chen, H. (1979). “Three methods for in situ cross-linking of polyvinyl alcohol films for application as Ion-conducting membranes in potassium hydroxide electrolyte.” NASA Technical Paper, 1407, 1-15. 17. Sheikh, N., and Kianfar, Sh. (2010). “Preparation of polyvinyl alcohol absorbent films: Comparison of radiation and chemical crosslinked films.” Journal of Nuclear Science and Technology, 50, 14-20. 18. Venkata, S.M., Vijaya, Y., Subba, A.R., Yuvaraja, G., and Krishnaiah, A. (2011). “Equilibrium, kinetic and thermodynamic studies on the biosorption of Cu(II) onto Trametes versicolor biomass.” Desalination, 276, 310-316. 19. Bahrami, S.B., Kordestani, S.S., Mirzadeh, H., and Mansoori, P. (2003). “Poly(vinyl alcohol)- chitosan blends: Preparation, mechanical and physical properties.” Iranian Polymer Journal, 12, 139-146. 20. Park, S.Y., Jun, S.T., and Marsh, K.S. (2001). “Physical properties of PVOH/Chitosan blended films cast from different solvents.” Food Hydrocolloids, 15, 499-502. 21. Ilhan, U., and Fuat, G. (2000). “Adsorption of Some heavy metal ions from aqueous solution by activated carbon and comparison of percent adsorption results of activated carbon with those of some other adsorbents.” Turk. J. Chem, 24, 291- 297. 22. Igwe, J.C., and Abia, A.A. (2007). “Adsorption isotherm studies of Cd (II), pb(II) and Zn (II) ions bioremediation from aqueous solution using unmodified and EDTA-modified maize cob.” Ecletica Quimico, 32, 33-42. 23. Burgess, J. (1978). Metal ions in solution, Ellis Horwood,Chichester, England. 24. Hamdaoui, O., and Emmanuel, N. (2007). “Modeling of adsorption isotherms of phenol and chlorophenols onto granular activated carbon Part I. two-parameter models and equations allowing determination of thermodynamic parameters.” Journal of Hazardous Materials, 147, 381-394. 25. Srinivasa, R., Popuri, Y., Vijaya, V. M., and Boddu, K.A. (2009). “Adsorptive removal of copper and nickel ions from water using chitosan coated PVC beads.” Bioresource Technology, 100, 194-199. 26. Cybelle, M.F., Wan-Chi, T., Shiow-Shyung, L., Maria, L.D., and Meng-Wei, W. (2012). “Copper, nickel and lead adsorption from aqueous solution using chitosan-immobilized on bentonite in a ternary system.” Sustain. Environ. Res, 22(6), 345-355. 27. Serkan, K. (2007). “Comparative adsorption studies of heavy metal ions on chitin and chitosan biopolymers.” M.Sc. Thesis, Izamir University, Turkey. 28. Krishnapriya, K.R., and Kandaswamy, M. (2010). “A new chitosan biopolymer derivative as metal-complexing agent: synthesis, characterization, and metal(II) ion adsorption studies.” Carbohydrate Research, 345, 2013-2022. 29. Tirtom, V.N., Dincer, A., Becerik, S., Aydemir, T., and Celik, A. (2012). “Comparative adsorption of Ni(II) and Cd(II) ions on epichlorohydrin crosslinked chitosan-clay composite beads in aqueous solution.” Chemical Engineering Journal, 197, 379-386. 30. Zhang, G.Y., Qu, R.J., Sun, C.M., Ji, C.N., Chen, H., and Wang, C.H. (2008). “Adsorption for metal ions of chitosan coated cotton fiber.” Journal of Applied Polymer Science, 110, 2321-2327. 31. Tran, H.V., Tran, L.D., and Nguyen, T.N. (2010). “Preparation of chitosan/magnetite composite beads and their application for removal of Pb(II) and Ni(II) from aqueous solution.” Material Science and Engineering C, 30, 304-310.